Viewers of Adom TV’s all-popular Televonela, Kumkum Bhagya could not believe their ears when it was announced that the Chief of Assin Asaaman in the Central Region has decided to reward personnel of Adom TV for being innovative and presenting to viewers the telenovela which is dubbed in Twi language. And indeed staff and management of the award-winning Multimedia TV station were surprised when Nana Kwasi Wadie Esly II in the company of his Linguist, Okyeame Kwadwo Gyekye, his wife, Mabel Maku Wadie and Sister, Atsu Agbey walked into the studios of Adom TV in his beautifully woven Kente cloth. His mission was to fulfill his promise to the management and staff of the TV station for introducing the Indian telenovela. “In fact, I become very excited anytime I watch persons of Indian origin speaking Twi…what really attracts me to watch the series is that the characters speak pure and unadulterated Twi and I can’t really find words to describe the moral lessons in the telenovela…I am very grateful to Adom TV for this…,” Nana Kwasi Wadie said when he toured the studios of Adom TV. Nana Wadie who is also the Kyidomhene of Efutuakwa Traditional Council, Assin Fosu toured of the studios of the TV station which is now available on Digital TVs. He then proceeded to present two fat cows to the management and staff of the TV station as a reward. 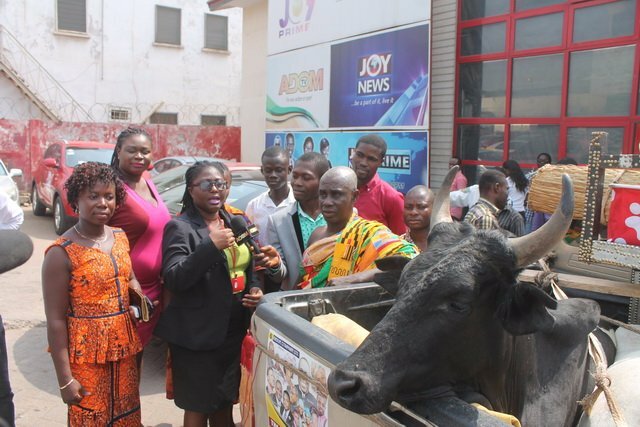 The two fat cows – a black one and white one – Nana said were a symbol of his appreciation to Kwasi Twum, Multimedia CEO and the entire management and staff for serving him and his subjects with interesting and educative programmes. Nana Wadie further appealed that local languages be used as a medium of instruction in schools and as the main language of communication on various media platforms to promote the country’s culture. Channel Manager of Adom TV, Abena Boakye-Yiadom who received the donation on behalf of management of The Multimedia Group thanked Nana Wadie and assured him that Adom TV would serve its ever increasing viewers with more interesting and educative programmes. “We appreciate the gesture done us, all we can say is that God bless you and make your kingdom prosper…we assure you that Adom TV would continue to present the best in educative programmes to our viewers…Kumkum Bhagya is just a tip of the iceberg of what we have under our sleeves…,” she said. Kumkum Bhagya is aired on Adom TV from 8:00pm to 9:00pm on weekdays with Omnibus aired on the same channel on 10:00am.